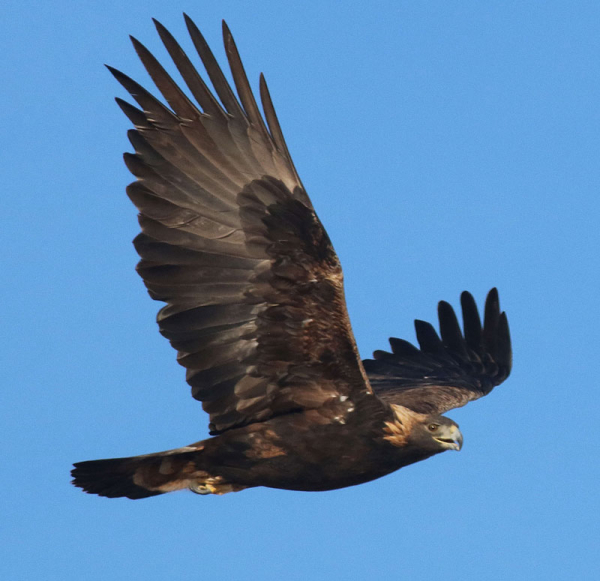 A perfect photo opportunity unfolded as a majestic Golden Eagle circled Paul three times Friday afternoon. 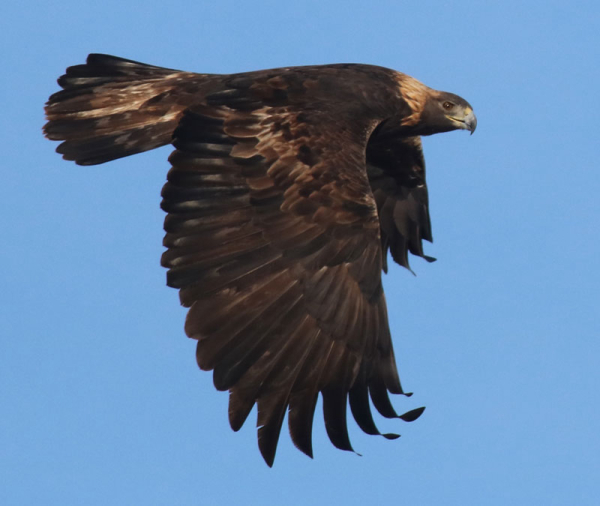 The Golden turned its head to look at me and seemingly responded by returning, flying with deep wingbeats low right above my head. I followed it through my camera, taking a series of photos as it approached and flew overhead – at that point I could only fit a portion of the Aquila in my frame but I took a photo anyway, just to remind myself how close the bird came after reacting to my call. As the grand bird began another banking turn, it led the Golden into the fine light zone again and I reacted by taking more photos until it slipped behind the branches again. A super-fast shutter speed stopped the action of the down-stroke of the wings to show the curvature of the long primary feathers. As the eagle flew back into view I called out again and it circled one more time, close; checking me out as I photographed all the way. What a fun birding episode! That’s the kind of photo opportunity that can’t be planned, or expected, or taken lightly. Under these conditions, I sometimes get a bit flustered and tighten up, and seem to have a hard time keeping the bird in the photo frame, but during this memorable episode I was relaxed and followed the eagle 360 degrees as it circled me three glorious times. I took some strategic photos at times, and also used some fast-frame photography to get a series of photos with which I could edit out a few choice images. I was ready for the unexpected. My camera was pre-set for an f-8 aperture preference, which provides a good middle-aperture option that kept all the flying eagle’s broad wingspan in the field of focus. (I always use the Av aperture-preference setting instead of an automatic setting). With plenty of late afternoon light, the f-8 Av setting automatically provided a super-fast 1/2500 of a second shutter speed to stop the action and provide crisp details of the feathers, even the bending of the long primaries, and the reflection of the sun in the eagle’s eye. I also instinctively kept my elbows tucked against my chest and side to steady the camera as I was actively keeping in sync with the ever-moving eagle. The auto-focus technology we almost take for granted these days provided the best options to get and keep the flying bird in focus – auto-focus remains one of the most impressive of all photo technologies and it frees us up to concentrate on other aspects of photography in the moment. The beauty and majesty of all birds can be appreciated in this classic image of one of the world's most wide-ranging eagles. 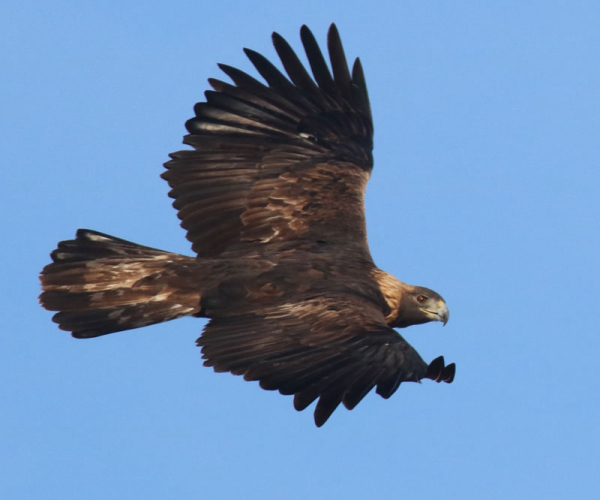 There were actually three other Golden Eagles in sight at the same time, and when you put yourself in the right location, at the right time of the year, with good lighting conditions and plenty of potential photo subjects, you have done all you can to create the opportunity to photograph impressive birds. In this case, I waited for the right weather conditions to ensure sunny days, then ventured to my SoDak raptor hotspot centered at Pierre, South Dakota. Familiarity with the area in season is also a factor; I know where to go and what to expect from previous experiences. Certainly, there were plenty of other exciting eagles, hawks and falcons to photograph in the area, along with a number of other exciting birds. You can get the inside story about the entire Friday-Saturday birding trip in this issue’s Editor Afield article above. Was this a once in a lifetime event? I’ll keep you posted.